Habit: Plant 3--70 cm, decumbent to erect, glandular, not strongly scented. Stem: generally not purple-streaked. Leaf: 4--100(120) mm, linear to lanceolate or oblanceolate, proximal lobed +- 1/2 to midvein. Inflorescence: peduncle < 13 cm; involucre 4--15+ mm diam, hemispheric; phyllaries 4--18 mm, tip often > (sometimes <) folded base, basal margins interlocked by cottony hairs. Ray Flower: 5--18; ray 3--21 mm, yellow throughout or distally white. 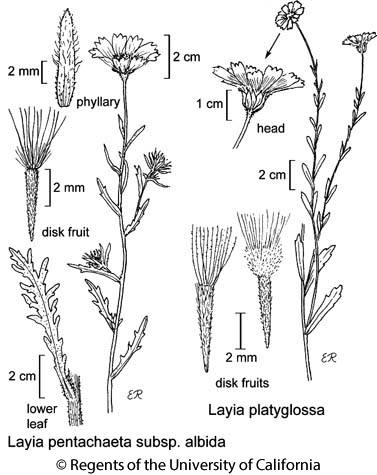 Disk Flower: 6--120+; corolla 3.5--6 mm; anthers generally +- dark purple, sometimes yellow to +- brown in SW. Fruit: ray fruit glabrous or sparsely hairy, dull; disk pappus of (0 or 11)14--32 bristles or bristle-like scales, 1--6 mm, +- equal, white to +- brown, generally scabrous throughout, generally not plumose and not adaxially woolly, sometimes short-plumose proximally and woolly adaxially in SW. Chromosomes: 2n=14. Citation for this treatment: Bruce G. Baldwin & Susan J. Bainbridge 2012, Layia platyglossa, in Jepson Flora Project (eds.) Jepson eFlora, http://ucjeps.berkeley.edu/eflora/eflora_display.php?tid=3757, accessed on April 21, 2019.
s NCo, s NCoRI, GV, CW, SW, w edge DMoj; Markers link to CCH specimen records. Yellow markers indicate records that may provide evidence for eFlora range revision or may have georeferencing or identification issues. Purple markers indicate specimens collected from a garden, greenhouse, or other non-wild location.